-- Please Select --Small: Age: 6-12 months. Height: 73-77cm. Waist: 48-49.5cm. Weight: 23-25lb Medium: Age: 12-18 months. Height: 77-83.5cm. Waist: 49.5-51cm. Weight: 25-27lb Large: Age: 18-24 months. Height: 84-89cm. Waist: 51cm-53cm. Weight: 28-30lb. 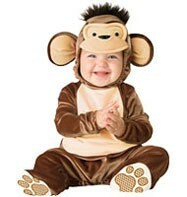 The cutest, cheeky monkey costume you're ever likely to see. This adorable outfit features a one piece, velour monkey bodysuit with elasticated wrists, skid resistant tread to feet, velcro fastening to back and under leg popper fastening for easy nappy change. Also included with this fun baby costume is a matching velour hood with cheeky monkey face, large round ears, plush tuft of hair and under chin velcro fastening. The perfect costume to put a smile on everyone's face ! ... Make sure you have your camera ready to capture the moment ! Age:	6-12 Months, 12-18 Months, 18-24 Months. Material:	100% Polyester, exclusive of decoration. Fastening:	Jumpsuit and hood have velcro fastening. 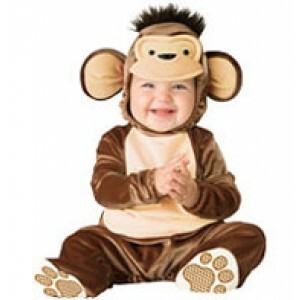 Includes:	Monkey jumpsuit with skid resistant feet and snaps for easp nappy change and character hood with plush tuft. Cleaning Care:	Machine wash, cold water. Gentle cycle. No bleach. Hang dry. Do not iron.